I was introduced to this recipe many years ago by my Aunt Kay. It is an easy, quick soup that is always popular with a crowd. 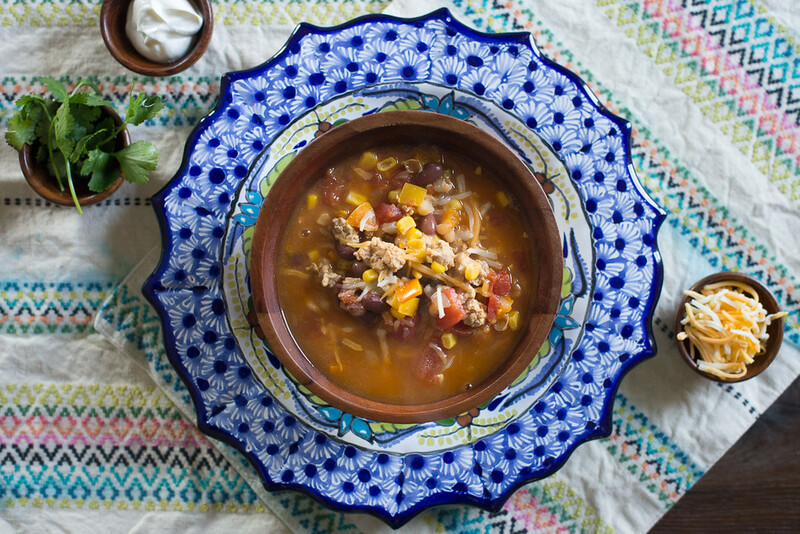 Who doesn't love tacos or a delicious soup? This recipe combines the two! You can vary the type of ground meat, using lean beef or turkey. We prefer ground chicken because my daughter is allergic to beef. Served with optional toppings, tortilla chips, and a side salad, it is sure to become a family favorite. Place ground chicken, onion, and bell pepper in a large soup pot and cook on medium high heat until chicken is no longer pink. Next add taco seasoning and give quick stir before adding beans, tomatoes, corn and water. Bring to boil then reduce heat to simmer for 30 minutes. Add toppings and enjoy!